Represent your favorite brand with an Inline skate skinsuit. 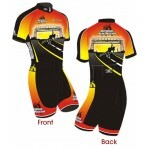 Inline skinsuits are available for companies such as Bont, CCN, Hyper, Luigino, NorthShore Marathon and Veloce'. You can even represent products such as Bont Mayhem, Bont Typhoon, Luigino Matrix or Luigino ONE. 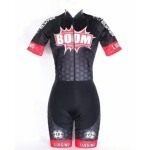 We even have someone of a kind inline skinsuits. 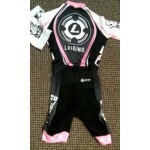 You will immediately notice that all sizes are not available for all inline skinsuits. Most skinsuits are made in one production run. When sizes are depleted they are usually no longer available as second production runs are usually not made. If a size is not listed it is no longer available. 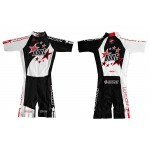 Bont Inline Skate Skinsuit Retro Neo Racing Suit Introducing the new Bont Retro Neo Inline Racing..
Bont Inline Skate Skinsuit Star Racing Suit SIZE Height(Cm) Weight(Kg) Wa..
Bont Team International Inline Skinsuit for inline skating. Made In China. Rear back zipper ..
Bont Team International Inline Skinsuit Genuine Bont Inline skate skinsuit. 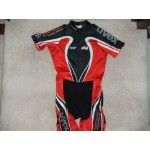 S..
Bont Inline Skate Skinsuit Team Racing Suit Manufactured by Hunter Sportswear. ..
Colombia Inline Skate Skinsuit: This is a great inline skate skinsuit uniform to represent C..
Emerald Coast Speed Inline Skate Skinsuit Great looking Emerald Coast Speed Inline Skate Skinsuit..
Luigino Inline Skate Skinsuit Uniform: This skinsuit uniform is the same design worn by the ..
Luigino ONE Inline Skate Skinsuit Uniform: This Luigino skinsuit is the same design wor..
NorthShore Inline Marathon 15th Anniversary Inline Skate Skinsuit: This quality made NorthShore I..
NorthShore Inline Marathon Skinsuit: This is a quality made inline skate skinsuit uniform. 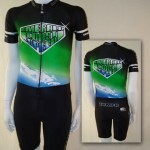 Off..
NorthShore Inline Marathon Finisher 2007 Skinsuit: The official inline skate skinsuit uniform of ..
Speedies TSV Bayer Inline Skate Skinsuit Uniform: Quality made skinsuit. Sizing Guide Chart ..